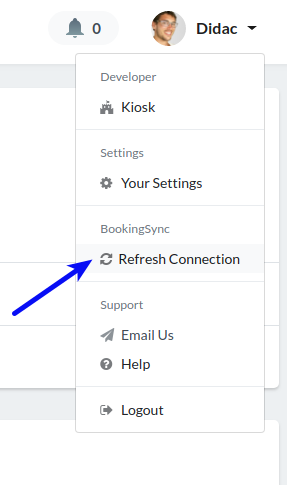 If you are receiving an email requesting you to re-connect with BookingSync it is because we lost our authorization to sync your RN data with BS. This might be due to inactivity in your account or any problem with your BookingSync account. Go to the the drop-down menu of your profile picture & name and click on the "Refresh Connection" option. You will be redirected BS (requesting your login credentials) to a page asking for confirmation. This process will try to reconnect both databases and re-establish the periodical synchronization. You will be sent a confirmation email.